The loop trail rings Table Mountain, shown here reflected on Hayes Lake, one of several linked along its northwest corner and collectively known as the “Chain Lakes.” Chain Lakes Loop, August 10, 2015. A 360-degree panorama radiates from Table Mountain, encompassing Mt. Baker, Mount Shuksan, Mount Herman, and the crinkled landscape of surrounding ridges and valleys. In contrast to its rugged neighboring peaks, Table Mountain is a flat-topped, roughly L-shaped massif thought to be the remains of a lava lake. Curious patterns in its stone attest to its formation from a molten state. The Chain Lakes Loop trail circles the mountain, with a short side trail up to its prominent eastern pinnacle. The two-mile/3.20-km loop trail around Bagley Lakes may be hiked separately or as part of the overall loop, extending its round-trip distance to approximately eight miles/12.90 km. Consistent with its name, the loop trail links a series of lakes (sometimes called the Galena Chain Lakes) strung around the foundations of Table Mountain’s imposing walls, with either Mt. Baker or Mount Shuksan — or both — nearly always in sight. The loop trail can be hiked from either Austin Pass or Artist Point, both of which provide ample parking and are linked by the steep, Wild Goose portion of the trail. (The Wild Goose Trail can be difficult to discern in places, especially where it is intersected by Highway 542 and many crisscrossing footpaths. When uncertain, look for mortared stone cairns marked with blue and white badges depicting a goose in flight to guide the way.) This profile begins at Austin Pass and proceeds clockwise up the Wild Goose Trail, taking a side jaunt to Table Mountain’s topside. The easily accessed loop trail is not as heavily trafficked as one might expect from the crowded parking lot and footpaths around Artist Point, which afford stunning views in their own right; nevertheless, one will periodically encounter other hikers and campers along the way. The steep and potentially vertigo-inducing side trail to the top of Table Mountain is even less travelled. Impressive views begin immediately. Here, Table Mountain sweeps upward to its eastern tower from the great Bagley Lakes Basin. The other end of the loop trail threads the pass between Table Mountain and Mount Herman’s dome beyond and rounds Bagley Lakes at the lower right. Wild Goose Trail/Chain Lakes Loop, August 09, 2015. Along Table Mountain’s southern edge, on both the Chain Lakes Loop and the Table Mountain Trail, Mt. Baker’s snow-clad cone figures prominently in the view. Table Mountain Trail, August 10, 2015. 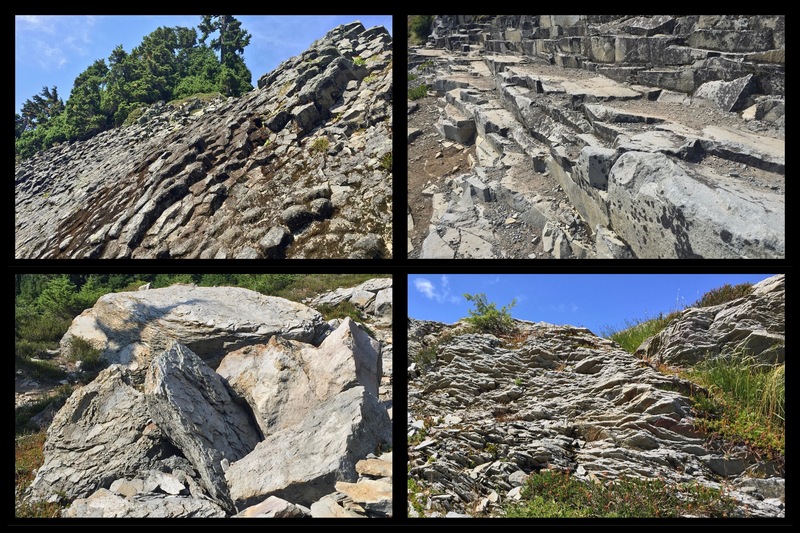 Outcrops of stone fractured into slabs, benches, and columns, neatly stacked as if by human hand, are characteristic features of Table Mountain. Wild Goose Trail/Chain Lakes Loop, August 09, 2015. 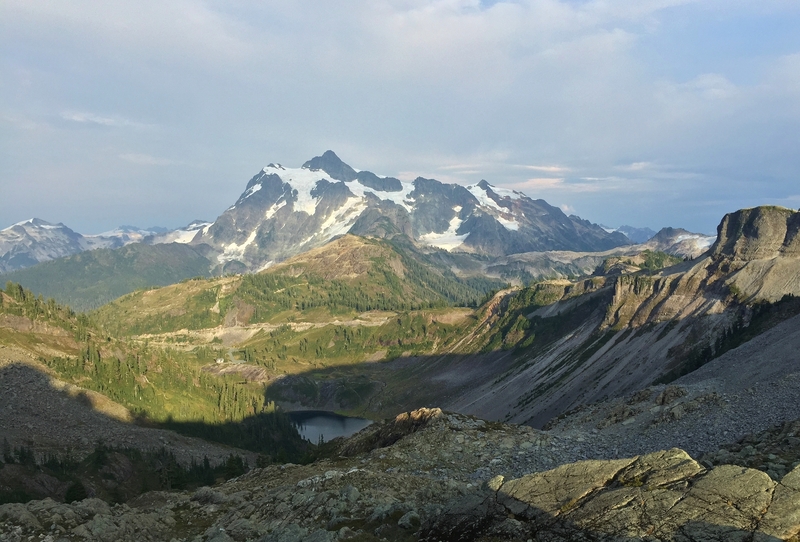 The Table Mountain Trail, in some sections very narrow and presenting some exposure, winds up and around the mountain to its eastern prominence, affording grand views of Mount Shuksan reclining majestically on the horizon. Here, the parking lot at Artist Point is visible far below. Table Mountain Trail, August 10, 2015. As the Table Mountain Trail rounds upward, Austin Pass and the sky-tinged Bagley Lakes lie directly below. Table Mountain Trail, August 10, 2015. From its eastern point, Table Mountain’s narrower arm stretches westward, commanding sweeping vistas. Beyond, lenticular clouds formed in the eddy of air currents swirling above Mt. Baker trail off before dissipating. To the south, just below Table Mountain’s far left, the Chain Lakes Loop trail is visible snaking around its corner. Table Mountain Trail, August 10, 2015. Although it appears flat from a distance, the surface of Table Mountain is a vast wasteland of heaped boulders and loose, tile-like scree, punctuated by sandy tarns that often dry up in the summer months. Beyond the mountain’s eastern peak, trails disappear into the shifting stone, rendering further progress difficult. 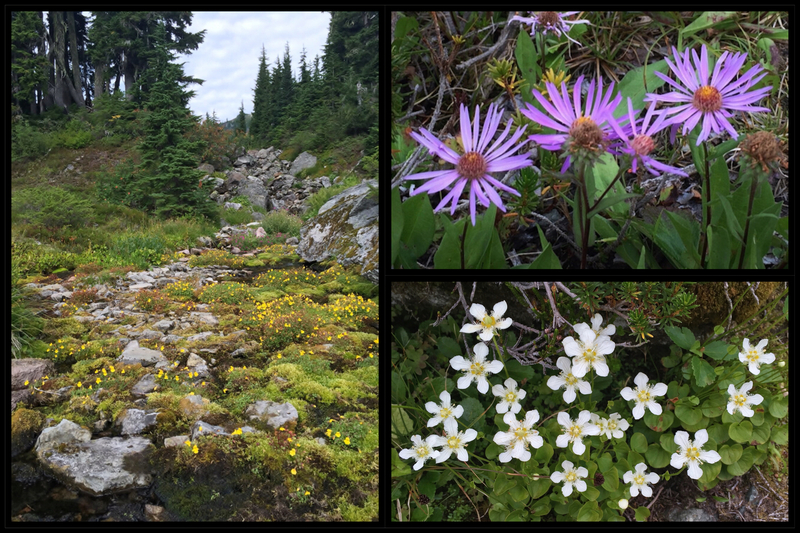 Table Mountain Trail, August 10, 2015. Table Mountain’s beetling ledges loom like gargoyles jutting above the Chain Lakes Loop trail on its southern flanks. Chain Lakes Loop, August 10, 2015. Mount Shuksan rises beyond the vast, empty slopes that sprawl southward from Table Mountain and eventually drop into wooded creek valleys (here, Swift Creek Valley) riven from deeper, even older volcanic deposits. Chain Lakes Loop, August 10, 2015. Mt. Baker bookends the view on Table Mountain’s opposite end. Chain Lakes Loop, August 10, 2015. Desolate fields continue around Table Mountain’s southwestern corner, where the trail to Ptarmigan Ridge diverges from the loop trail. Chain Lakes Loop, August 10, 2015. A fortress-like butte guards the eastern end of Ptarmigan Ridge, which arcs nearer Mt. Baker. Chain Lakes Loop, August 10, 2015. Moisture and greenery return to the landscape near Mazama Lakes, first in the series of lakes encountered in a clockwise circuit of Table Mountain. Chain Lakes Loop, August 10, 2015. Table Mountain’s distinctive western knob rises beyond Mazama Lakes. Chain Lakes Loop, August 10, 2015. In contrast with much of the trailside’s stony barrens, a few blooms appear where sufficient moisture permits, including monkey-flowers (Erythranthe sp.) (left); asters (likely alpine leafybract asters, Symphyotrichum foliaceum) (upper right); and fringed grass-of-Parnassus (Parnassia fimbriata) (lower right). Chain Lakes Loop, August 09, 2015. Iceberg Lake’s placid waters mirror Mazama Dome and Table Mountain. The cleft between Mazama Dome and Table Mountain (and Mount Herman beyond) is Herman Pass, where the loop trail begins its descent into the Bagley Lakes Basin. Chain Lakes Loop, August 10, 2015. The loop trail crosses the narrow strip of land between Iceberg Lake and Hayes Lake before ascending Herman Pass. A side trail leads to the far end of Hayes Lake, beyond which unofficial boot paths may be followed with some difficulty to neighboring Arbuthnot Lake. Here, Mazama Dome unites with its own reflection on Hayes Lake to form a stony orb. Chain Lakes Loop, August 10, 2015. A band of waterlines across Hayes Lake’s bank marks the customary range of its level. This photo was taken during western North America’s 2015 drought. The actual water level is visible in the photo’s lower right corner. Chain Lakes Loop, August 10, 2015. As the loop trail rounds Iceberg Lake and climbs the Herman Saddle, Ptarmigan Ridge and Mt. Baker return to sight. Chain Lakes Loop, August 10, 2015. From the Herman Saddle, the great columnar joints in the hardened lava that forms Table Mountain are visible in the vertical striations along its northern tip. Chain Lakes Loop, August 10, 2015. Where the trail descends the opposite side of Herman Pass into the Bagley Lakes Basin, vast talus slopes fan down from Table Mountain’s eastern ridge. Chain Lakes Loop, August 10, 2015. In the view from the Herman Saddle, Mount Shuksan basks in day’s falling light. Chain Lakes Loop, August 10, 2015. Near the trail’s end, eventide settles on the Bagley Lakes and softly illuminates Goat Mountain and Point 6891 beyond. Chain Lakes Loop, August 10, 2015. HesperosFlown.com acknowledges that, from time immemorial, the magnificent landscapes profiled on this site have been and are the birthplaces, breadbaskets, hunting grounds, thoroughfares, and sacred spaces — homelands — of the first inhabitants of this land. Every effort is made to accurately and respectfully identify the First Peoples of these places. Any corrections or additional information are humbly requested via this site’s “Contact” form. May we be ever mindful of those who came before us, whose spirits and children remain among us, and so honor the land we now all call home. Of course, one should consult a physician before engaging in the strenuous activity required to visit some of the amazing places profiled on HesperosFlown.com. And, nothing substitutes for common sense in getting you back home safely. If an iffy-looking ledge or snowfield doesn’t look or feel right to you (regardless of what other hikers are doing), don’t attempt it. Nature will still be there for the next visit – so should you! Unless otherwise noted, all content contained on this website is protected from unauthorized copying and dissemination by United States copyright law, trademark law, international conventions, and other intellectual property laws.